We give our students access to the wide world of music — from private music lessons to ensemble playing, Mozart to Metallica, there is a program here for any child or adult who is interested in music. We even have classes for very young children in our Kindermusik program and a Summer Camp for ages 4 to 5. Larchmont Music Academy offers private music lessons in all instruments for beginning through advanced students. Lessons are offered in 30, 45, and 60 minute lengths, depending on age and proficiency level. There are approximately 18 lessons per semester, two semesters per year, and a summer session. Students are strongly encouraged to participate in our ensembles and theory classes. Watch the video below to learn about LMA's Carnegie Hall Performances! 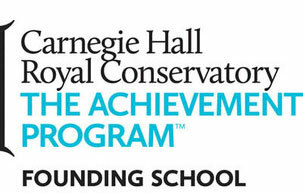 Larchmont Music Academy is a Carnegie Hall Royal Conservatory Achievement Program Founding School. 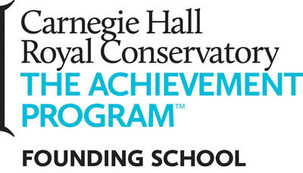 The Academy supports outstanding student growth and achievement by participation in The Carnegie Hall Royal Conservatory Achievement Program. The Achievement Program provides a recognized national standard of musical success through an effectively sequenced course of study from beginner to advanced levels in all instruments and voice. The Achievement Program inspires excellence through individual student assessments and allows students to celebrate accomplishment and track their progress with others across the country. Learn more about this program online at https://www.rcmusic.com/ or contact the Academy. This is an exciting opportunity for students to enhance their learning and pursue excellence at all levels. Students are encouraged to experience the joy of playing music with their peers. The Academy offers wind ensembles, string ensembles, percussion ensembles, and jazz ensembles. Students of like ability and proficiency level are free to explore the exciting world of chamber music coached by our faculty members. The Larchmont Percussion Ensemble is a workshop percussion ensemble and performance group made up of middle school and high school percussionists at beginning to intermediate levels. They perform repertoire spanning from classic rock percussion arrangements to "Junkyard" ensemble music (such as bucket drumming), as well as more classically based material. Percussionists in the ensemble are given the opportunity to learn a wide variety of instruments including keyboard percussion (xylophone, glockenspiel, piano), vibraphone, snare drum, drum set, and world percussion (congas, djembe). The Academy Choirs are unique opportunities for students of all ages and levels to perform together. The music is fun and offers a challenge for each student. They rehearse on Saturday mornings and perform each year throughout the community and at Carnegie Hall. The Academy Clarinet Choir is comprised of clarinetists of all ages and levels. We try to make the music fun and enjoyable, ranging from early music such as Bach and Mozart, to film scores, today's pop hits, and everything in between. Students will get the opportunity to experience playing the auxiliary clarinets including; the E-flat clarinet and Bass clarinet. These add amazing colour and balance to the ensemble, as well as a fantastic learning experience for the students. The Academy Clarinet Choir rehearses on Saturday afternoons under the direction of Ty Wes, teacher of clarinet at the Larchmont Music Academy. The Academy Singers is a performing choral ensemble that welcomes students of all ages! It is a diverse ensemble ranging from students with no choral background to students with many years of choral experience. Rehearsals focus on enhancing musicality, maintaining healthy voice technique and applying this to choral repertoire. Teamwork and building lasting friendships are aspects the group enjoys throughout the rehearsal process. The chorus’s repertoire spans from popular tunes to classical choral selections. Being an excellent performing ensemble the Academy Singers have the honor to sing at Carnegie Hall with Larchmont Music Academy as well as many other local performances. This is a one semester small group class designed to introduce your child to the joy of playing the piano through fun games and exploration. The semester long class will explore basic concepts of piano from the very beginning introduction through the end of the primer level. Each child will learn about the staff, start to read notes, rhythms, and play fun short songs. As the semester progresses the teacher will determine the best match for private lessons for your child's learning style and ultimate creativity. The teacher will visit the class to ensure a great fit and match for on going lessons. Each semester will conclude with a recital party and placement with the perfect teacher. We will group 4 - 6 children of like age and ability. Each class will be 45 minutes with a 10 minute sharing time at the end to get homework and see what the class learned each week. These classes introduce students to elements of ear-training, solfege, sight singing, dictation, composition and improvisation. Classes will be interactive, fun and are held in our computer lab. Classes are scheduled by appointment and are grouped according to level. Private AP Music Theory lessons are offered to prepare students for the AP Music Theory exams. LMA students routinely score 4 and 5 (a perfect score) on these exams. With the Academy Master class Series, world class artists are invited to the academy to conduct monthly master classes for our students. Watching and working with some of the world’s master performers is truly inspiring. Students may sign up to attend a master class or audition to participate. Each master class will be followed by a performance in the community. Students may be nominated by their teacher to join the prestigious Academy Honors Program. This program is a complete pre-college musical education including private music lessons, ensemble participation - both large and small groups, music theory - AP music preparation, master class participation, performance requirements, guaranteed nomination to audition for the Carnegie Hall Student Concert, end of semester evaluations, audition preparation, and college application assistance and recordings. Please contact the Academy for instrument specific requirements for this program and for more information. Start your summer off on a high note. Campers ages 4-7 will meet the instruments of the orchestra, while reinforcing listening skills, teamwork, and creativity. Each day campers will meet a different family of instrument. They will hear each instrument, learn how they each work with hands-on demos, and even make an instrument from each family to take home. From winds to strings, brass to percussion, no note will be left un-played. Larchmont Music Academy Mini Summer Camp!